Home / Body / Review: How To Treat Seasonal Affective Disorder SAD – For Better Beauty Sleep With Philips Wake-Up Light – Therapy Gently Wakes You! Review: How To Treat Seasonal Affective Disorder SAD – For Better Beauty Sleep With Philips Wake-Up Light – Therapy Gently Wakes You! We’re in deep winter, so you might find yourself getting a case of the winter blues. And if you’re on the East Coast, then this Polar Vortex has really got you down. The mornings are dark and cold, and when you hear that alarm clock go off in the morning, well, that’s exactly what you want to do — “go off” on your alarm clock! Skinceuticals Resveratrol B E Antioxidant Night Concentrate – Fight Free Radical Damage While You Sleep! I’m not ashamed to say that the winter weather can certainly get me down sometimes. I incorporate more exercise to avoid those moody slumps. But I also found a new way of waking up more energized and feeling less irritable. I have been using the Philips Wake-Up Light since December, and boy, has it made a difference in my morning disposition. You can say that I am slowly but surely becoming a morning person. 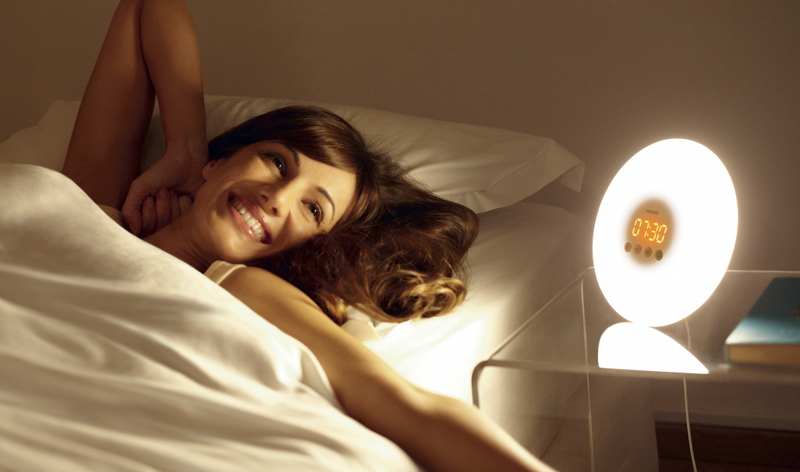 The Wake-Up Light simulates the natural rise of the sun by using a unique combination of light therapy and sound to wake you up in a gentle and natural way, so you are ready for the day ahead. How do you think people got up in the morning before alarm clocks? They would naturally awake to the warm and inviting glow of the sunrise. Research shows us that people who wake up early are happier, healthier and more satisfied. A recent survey found that nearly 6 out of 10 employed Americans hit the snooze button at least once a week – and hitting the snooze button enables bad habits that detract from a healthy morning routine. “Philips is committed to improving peoples’ lives through innovative products that enhance their existing routines,” said Annette Domnik, Senior Marketing Director at Philips Consumer Lifestyle. It’s easy to use and the clock’s sleek, white design is quite appealing. You simply set your time for when you want to wake up and 30-mins before your alarm goes off, the warm, yellow light gradually brightens the room — just like the sun. Unknowingly, your body will begin to wake up and you feel less groggy and cranky. Light falls on your eyes and increases the level of energy in your body, gently preparing your body to wake up. This makes waking up a more pleasant feeling. And it really does work! The sensitivity to light differs a lot per person. In general, when using a higher light intensity a person needs less time to become fully awake. The light intensity of the Wake-Up Light can be set up to 200 lux. This makes sure you can wake-up to the light intensity that suits your personal preference best. And if you have to hit the snooze, you simply tap the top of the light and in 9-mins the alarm will sound again. I try not to do this too often. So, are you beauties getting those winter blues? Need a better way to wake-up in the morning?